"An entire roomful of children were completely engaged and entertained the whole time. The energy in that room was absolutely electric and uplifting from start to finish. and I’m a Daredevil Circus Wizard! What is a Daredevil Circus Wizard? Seriously, I am a comedy variety entertainer with over 20 years of experience. I like to mixes jokes, gags and magic tricks to entertain all ages, all at the same time! 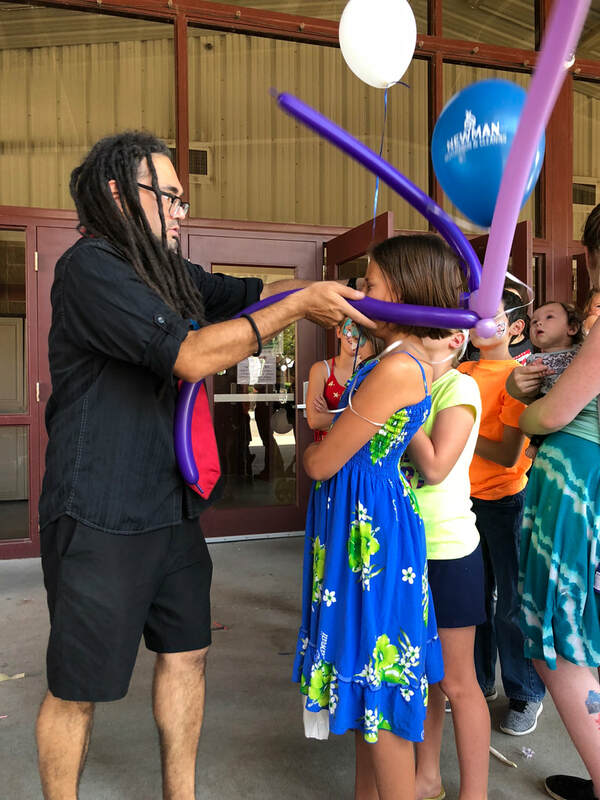 I have a wide variety of performance experience at fairs, festivals, conventions, birthday parties, lessons, workshops, corporate events and even party hosting! I can make any event more fun! On a VERY overstimulating day. Kameron is perfect for that crazy day because he has performed at HUNDREDS of parties. Even Mothers and Teachers proclaim how good he is with kids. That's how Good He is. He’s had a lot of practice. Kameron Performs A Private Magic and Balloon Show at your Party! Perfect for Kids age 5-9, but the Whole Family will Enjoy Kamerons Jokes, Magic and Charm! Some Parties Have a Feel. Have Kameron Blow Fire at your Party like those guys in the movies in olden times. Just a guy playing with fire in the background of YOUR party. Kameron will be the life of the party as He Roams Around With His Jokes, Gags and Magic. ​with everyone at your party. Never have another boring party. I invite you and your family to come have fun hanging out with me! I will be making balloons, practicing a new magic trick or juggling some fun juggling toy! Because it is not as fun alone. so after school stop by to say "Hi!" Play games or just hang out! Or whatever we're doing that day! I’ll post on social media where when and what I’ll be doing at a park in the area. While you’re there ask me about my shows and lessons! Kameron loves performing at restaurants while sculpting balloons and joking with the kids and families! He also can perform roaming magic to keep people having fun! Kameron loves passing on his talents to others. Kids love learning how to make a balloon dog or juggle a ball for the first time. The sense of accomplishment and pride you get from learning something you NEVER thought you could learn is the greatest feeling in the world. Kameron can lead groups or individuals through learning basic magic, balloon twisting or juggling. Do you have a fair or festival you need entertainment for? Kameron has a wide variety of talents to enjoy! Experience Magic, Juggling and Balloons all while having a blast! Kameron can perform a traditional stage show, or roaming! Throw a juggling or balloon animal workshop into the mix for more fun! "Kameron Messmer is one of the most gifted children's entertainers I've ever had the pleasure of watching." ​ I can't wait to see him again!" Thats not her. I don't know that lady.